NEW YORK, Nov 1 2012 (IPS) - As the East Coast deals with the havoc and devastation wrought by Hurricane Sandy, climate scientists are seeing yet another reason to put climate change and global warming on the current political agenda. The storm has reignited the hotly debated topics of climate change and global warming, which environmentalists blame for Hurricane Sandy. With recovery an immediate concern, environmental groups also worry about different forms of pollution resulting from the storm. “Sandy is what happens when the temperature goes up a degree. The scientists who predicted this kind of megastorm have issued another stark warning: if we stay on our current path, our children will live on a super-heated planet that’s four or five degrees warmer than it is right now,” said Bill McKibben, president and co-founder of the climate advocacy movement 350.org, in a press release. Global warming is caused mainly by human activities such as burning fossil fuels like coal. This operation and others lead to higher concentrations of greenhouse gasses that raise the temperatures of both the oceans and the earth’s atmosphere. A recent report published by the Rainforest Action Network demonstrated that banks that finance and invest in carbon intensive companies are also responsible for the deteriorating global climate. They also do not properly measure their carbon footprints, despite sufficient and available guidelines to help them do so, according to the report, “Bankrolling Climate Disruption: The Impacts of the Banking Sector’s Financed Emissions“. Not everyone agrees with the claim that global warming and climate change alone have paved the way for Hurricane Sandy. “It’s a probabilistic issue. You can’t say that Sandy occurred because of climate change, but what you can say is that that such storms are much more likely to happen with contributing factors that include things directly related to climate change,” Steven Hamburg, chief scientist at Environmental Defence Fund, told IPS. 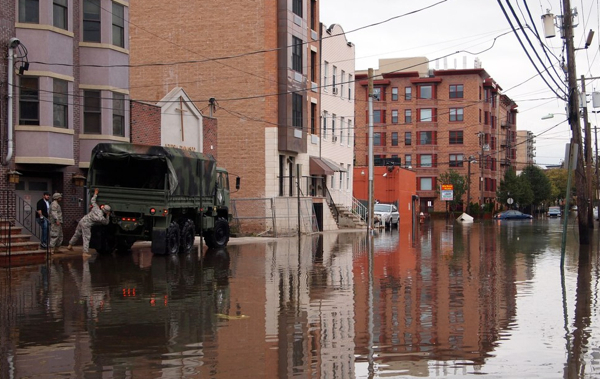 “Could Sandy have happened without climate change? Sure. Is it likely? No,” Hamburg added. David Biello, an environmental journalist and associate editor at Scientific American, agreed. “Global warming didn’t spawn Sandy but it certainly contributed to the impact, with a couple of features definitely worsening it,” he told IPS. One conclusion on which experts do agree is that the frequency and intensity of hurricanes like Sandy will increase over time. “Global warming was probably a small but significant factor for Sandy. But it’s a factor that will grow over time,” Michael Oppenheimer, climate scientist and professor at Princeton University, told IPS. “Such massive storms only happen once every 100 years, and now this kind of event is becoming more frequent, which is a huge challenge for human adaptation and resilience of our infrastructure,” Biello elaborated. Hurricane Sandy has broken the so-called “climate silence” of this year’s elections. The storm has thrown a wrench into campaign efforts, halting activities Monday and Tuesday as it became impossible to ignore the topic of climate change, which has penetrated the national dialogue. “The presidential candidates decided not to speak about climate change, but climate change has decided to speak to them,” said Mike Tidwell, director of the Chesapeake Climate Action Network, in a press release. The New York-based organisation Riverkeeper expressed concern about the increase in water pollution due to floating debris, oil spills, and other chemicals leaking from the fuel tanks of swamped vehicles and boats, all of which are contaminating the waters of the Hudson River and New York Harbour. Riverkeeper also stressed the danger to public health caused by sewage overflows, which are already considered a “chronic problem”. In a press release, the group explained that although sewage overflow is common during moderate or heavy storms, the contamination with Sandy was different because during the storm surge sewage, spilled back onto roads and into homes instead of being discharged into the river or harbour. Ask them if they’ve heard of Cloud Seeding. Ask them how long that’s been done. Ask them if it didn’t work, we’d still be PAYING to have it done. Ask them whether we have thus PURPOSEFULLY changed the climate. Ask them if Al Gore invented the Internet before inventing Global Warming. Ask them if they still believe in Climate Change being something that they ought to be TAXED to stop. Smile! @stevor, maybe I’ll just ask you if you could name me a single credible scientific body that teaches that global warming is merely Al Gore’s ‘invention’, and NOT a very real threat to our children’s future. One that was both exacerbated and accelerated by mankind’s incessant burning of fossil fuels. 32 billion tons of CO2 gets injected into our atmosphere, every single year…and you think this would somehow have no effect on our planet? Sadly, you’re just another gullible ‘critic’ embracing the oil industry’s obfuscating propaganda. Voting is one of the only ways we have to make our voice heard. If you think that there is any chance that climate change is real, then vote for the people most likely to reverse climate change (the president isn’t the only influential person being elected). The results of this election will change the world. Will it be for better, or for worse?